Whether you are thinking about career management, managing your small business or venturing out as an entrepreneur the Massachusetts Conference for Women 2013 is a great way to get you motivated as you enter the upcoming new year. This is the 9th year of this conference that offers speakers and break out sessions for women looking to take things to the next level. This year’s conference will have some interesting key note speakers, as is usually the case. 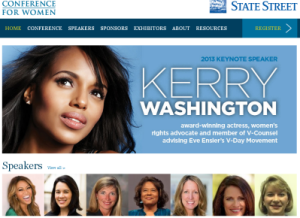 For those of us that are fans of the ABC show Scandal, you may be surprised to know that actress Kerry Washington is a women’s right activist as well. She will be speaking alongside Doris Kearns Goodwin. Washington and other speakers will share their experience and expertise on a range of topics including personal growth, career advancement, money management, health and wellness, small business and entrepreneurship, social media branding and more. This year’s Conference theme “The Power of Us” encourages women to take a greater role in changing the course of their own lives and in being a force for change in their communities. I really admire both women so I am sure they will have plenty to offer regarding their unique journeys and the challenges that they have faced. Washington recently hosted Saturday night live and in a very funny way illustrated how the show needs to add African-American actresses to the cast. The skit had her having to go back and forth to change into different character outfits for Oprah and Michelle Obama since there was no one else to play the roles. It was pretty funny but proved the point. Saturday Night Live of course had to be in on it but I think Kerry Washington’s elevated stature is what pushed it forward. There is still time to register for the conference that takes place Thursday December 5th from 7:30am to 5pm at the Boston Convention and Exhibition Center. Here is the direct link to the Agenda so you can decide what you want to participate in. If you are a student you get a deep discount but you need to make sure you bring your student id.